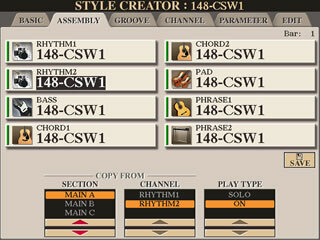 One of the strengths of the Yamaha's arranger keyboards (PSR, Tyros, and CVP) is the ability of the STYLE CREATOR in DIGITAL RECORDING to modify individual style tracks in a style. The lesson on the Mixing Console under Adjusting Styles, shows how to modify the volume of an instrument in a track and how to change the instrument itself. But these changes do not change the underlying music that is being played in that track. What about changing the track itself? Suppose you have a style and you don't like the BASS part. You want to change the BASS part in that style to a BASS part found in some other style. Well, you can do that with your keyboard and we show you how to change individual style parts in the next lesson. In this lesson, we tackle a slightly different problem, one that might be a first step in some cases before taking the second step of changing individual tracks. Styles for earlier Yamaha PSR arranger keyboards, like the PSR-640, included only two variations (A and B). But the current PSR and Tyros keyboards support 4 variations of a style (A, B, C, and D). If you want to use a style from one of these earlier models, you may want to expand the style variations from two to four. In this lesson, we explain how you can use your PSR or Tyros itself to solve this problem. Here's a brief overview of what you do to convert a 2-variation style to a 4-variation style. You load a two-variation style from, for example, the PSR-8000 (or the PSR-620 or PSR-1700). There are many two-variation styles on this site in some of the style collections or on the PSR-8000 style page. Note that in the 2-variation style, only the Main A and B buttons are lit; there is no style variation in C or D. Press the DIGITAL RECORDING button, select the STYLE CREATOR. Press the MAIN C button to select that section. Tab over to the ASSEMBLY page. From here you can copy all eight tracks from section A to section C. Next, you switch to the D section and copy all the tracks from the B section to the D section. Finally, you SAVE the modified style, probably using a new name. The original two style section (A B) now has four sections (A B C D) where the new "C" section is a copy of A and the new "D" section is a copy of B. At this point, you can make further modifications to the new and/or old sections to provide more variety to the styles. OK, that's the summary. Now, let's look at the details. First of all, you have to have a two-variation style. None are included with your PSR or Tyros; all the preset styles already have 4-variation. The preset styles of the PSR-8000, however, contain only 2 variations. As an example, let's convert one of those to a 4-variation style. You can download all of the original PSR-8000 styles from our PSR-8000 page in the Styles section. These are in zip files by style category. When you unzip the file, you get the original styles. However, for simplicity, let me give you one right here. You can use it to practice. Here is the CountrySwing ( 148-CSW1.STY ) style from the PSR-8000 Country category. From the MAIN screen, press the button that selects the STYLE. If you have this style on the USB, tab over to USB and load this two-variation style. If you are going to be working on this style, it may be more convenient to go ahead and save it in the USER area. (You could also COPY the style from your USB and PASTE it in the USER area.) You can then load the file from the USER area and make modifications to that copy of the file. When you are finished modifying the style, you can then save it back to your USB or Hard drive. On the Tyros5, two MENU buttons, FUNCTION and CREATOR, are located just to the right of your MAIN screen right above the MUSIC FINDER button. Press the CREATOR Button. This brings up the CREATOR MENU. On the Tyros4, the three MENU buttons, FUNCTION, VOICE CREATOR, and DIGITAL RECORDING, are located just to the right of your MAIN screen. Press the DIGITAL RECORDING button. This brings up the CREATOR MENU. On the PSR-S970, press the FUNCTION button, located on the bottom right of the center display right under the "J" button. Then, Tab over to MENU2 where the STYLE CREATOR is the first option. 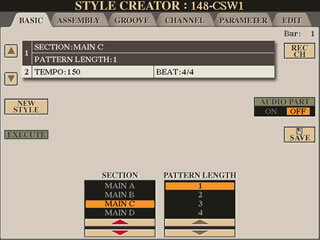 Press the STYLE CREATOR opion to bring up the Basic Style Creator screen. The screen shots below are from the Tyros5. You enter the STYLE CREATOR window under the BASIC tab. In this screen shot, the section is MAIN A and you note that the pattern Length is 4. When you create your new MAIN C, you need to make sure it has the same pattern length as A does. Pressing the MAIN C button on the keyboard brings up the SECTION screen shown in the lower right-hand corner. Main C is highlighted since that is the button you pushed. Press OK to signify that C is, in fact, the section you want to work on. 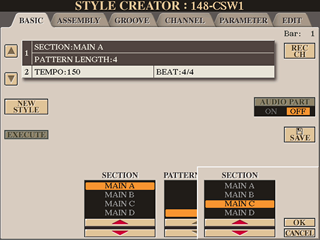 The BASIC tab shows that you are now working on MAIN C. The default pattern length is 1. Use the buttons at the bottom of the screen to set the pattern length to "4" to match what is in A. Then, tab over to the ASSEMBLY tab right next to BASIC. 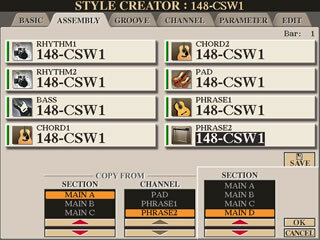 The ASSEMBLY screen shows the 8 style channels (RHYTHM1, RHYTHM2, BASS, CHORD1, CHORD2, PAD, PHRASE1, PHRASE2) and the current style loaded. 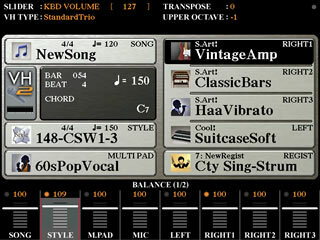 In this screen shot RHYTHM2 is highlighted. Copy information is at the bottom of the screen. You want the COPY FROM section to be MAIN A because you are copying all the parts of that section into MAIN C. The CHANNEL at the bottom should match the channel you have highlighted above -- you want the RHYTHM2 from MAIN A to go to MAIN C. In MAIN A, RHYTHM2 is on, and we want to keep that in MAIN C as well. Now, you want to do this for all 8 voices. Press "C" to highlight the BASS channel and make sure the COPY FROM section is set to "A" and the Channel is set to BASS and PLAY TYPE is ON. Do this for each voice. Once all of the voices in MAIN C are reset to copy from MAIN A, you can press the MAIN D button on the keyboard to switch to working on the D Section. Note the SECTION selection screen in the bottom right-hand corner. Make sure MAIN D is selected and press OK.
Repeat all the steps for MAIN D. Go to the BASIC tab and set the pattern length to 4. Go to the Assembly tab and set all 8 voices to copy from MAIN B this time. The channels will all be the same as will the PLAY TYPE so all you really have to do is select a voice and then make sure the SECTION on the bottom is set to MAIN B. When you have set all the channels in MAIN C and MAIN D to be copied, press the [J] button to SAVE your new modified style. The STYLE save window appears and it shows the area from which you loaded the original style. If you had copied the style to the USER area, it will be showing the USER area. You don't have to save it to this area; you could tab over to a different area (hard drive or USB) and save the style there. But, you may want to do more tuning, so go ahead and save it to the USER area. You press the [6-B] button to select SAVE. You will be given an opportunity to rename the file. To complete the saving operation, press the [8-A] button to confirm OK that you want to save the file under this name. I renamed the file while saving by adding a "-1" at the end of the name. This version has four sections, but since it originated with the PSR-8000, the balance was off when played on the Tyros5. So, the first exercise was to reset all the accompaniment voices to zero, and then readjust the volumes on each voice until they were nicely balanced. You could also replace some of the instruments used at this point as well if you wanted. I saved that version using a "-2" suffix. The PSR-8000 styles did not have OTS. So, the next step was to add OTS voices for all 4 sections. I had registrations with the OTS voices from several Tyros4 and Tyros5 county styles and selected different combinations to build the four OTS for the new style. That version I named with a "-3" suffix, which you see in the screen shot above. Here is a copy of the final modified CountrySwing style. This page updated on November 18, 2017 .